You can climb Kilimanjaro in any of the four seasons, but there are many good reasons trekkers come in the equatorial summer months of December-January-February. Kilimanjaro’s weather is shaped by the Southeast trade winds blowing over the Indian Ocean carrying moisture. This setup makes for two dry and two wet seasons. March to May is the wettest season especially on the southern slopes while the dry seasons include mid-December to early March and June-October. December is the snowiest at the summit so the possibility of fresh snow on the summit is real, but it rarely is heavy enough to stop climbers from attaining the summit. Tusker has designed a Christmas climb to capitalize on it with its guides getting into the holiday spirit with a few carols or two. The Tusker kitchen seasonally adjusts with holiday fare such as a ham dinner. Old Saint Nick’s reindeers feel at home in the snows of Kilimanjaro so don’t be surprised if he drops in. Being 212 miles south of the equator, Kilimanjaro is just barely in the southern hemisphere so temperatures don’t vary greatly throughout the year. During the January-February dry season temps are nearly perfect for climbing, ranging between 50-60 degrees in the mountain’s mid elevations. You may be sweating in the steamy rainforest at the bottom and be chilled once you get above tree line where the temps can dip into the 20s. Dress accordingly. Remember these are historic averages and in a global climate changing world don’t be surprised if it’s warmer than anticipated and perhaps wetter. Rains could come earlier than the mid-March start to the wet season. Tusker does not offer climbs from Mid-March to May 19 because of the long rainy season. November is the short wet season, but those rains sometimes extend into December. Tusker founder Eddie Frank has climbed Kilimanjaro 52 times covering all seasons and all routes. His experience has shaped the Tusker itinerary and has been tweaked over the last decade or so. Kilimanjaro is far from a static place and Eddie has adjusted seasonally. Spiral is the eighth and newest route on Kilimanjaro. It was first offered by Tusker in 2018 after Eddie carefully studied the mountain and pioneered the hike on an exploratory climb. Spiral is also the longest trek with 10 climbing days providing greater acclimatization time as well as enjoyment of the mountain’s scenic and natural features. It takes advantage of the good weather allowing trekkers to experience all four sides of the mountain and see varying landscapes, wildlife as well as weather. The next Spiral route trip is scheduled for Feb. 6-Feb.18. The Kilimanjaro 360 route is slightly shorter at nine climbing days and spends four days on the remote, untouristed Northern slope. The trek meanders at the 13,000 foot mark and produces over a 98 percent summit success rate. This loop climb will be offered Dec. 16-27, 2018 and in 2019, Jan. 5-16 and Feb. 10-21. Lemosho is another Eddie favorite and he has scheduled six Lemosho climbs in February alone. It is one of the least traveled route of the six historical Kilimanjaro routes and Tusker Lemosho climbs include a night in Kilimanjaro’s crater. Few companies offer this experience and in February while still cold it is achievable. The November rains pay dividends on the Kilimanjaro landscape carpeting the middle elevation grey volcanic landscape and lower green montane rainforest with spectacular flowers in January. Trekkers with an appreciation for flora are often blown away in mid-January an hour into their trek with the Kilimanjaro Impatiens that often lines the trail. As they ascend they often see star fire lily, African blood lily, begonia, red hot poker, Mackinder’s Gladiolus and golden daisy bush. This flower show extends all the way up to 15,500 feet and is a nice bonus for those from North America and Europe where it’s anything but blooming in January. These perennials put on a show during Kilimanjaro’s summer months and often attract insects and birds that you would not otherwise see. The photo ops are intensified by these spectacular wildflowers many of which you won’t see on high altitude hikes anywhere but in equatorial Africa. Many climbers, after completing their climbs, do optional safaris into the nearby Serengeti. “Dec-Feb is also the best time to visit the Serengeti after the climb. This is when the animal migration has moved into the easily accessible southern Serengeti,” Eddie said. The Great Migration of wildebeest, zebra and the predators that follow them arrive in the southern Serengeti after these southern grasslands have sprung to life from the November rains. This is a return to their breeding grounds and this vast area has weather in the 80’s. For most of the year this area is devoid of the vast herds of wildlife but not in the January-March window. Weather in the Ngorongoro Conservation Area is cooler because of its higher elevation but also a good time of year for wildlife viewing. Sunlight shouldn’t be your only consideration on picking a date for your summer climb. Consider when the moon will be full on your trek. Upcoming full moons include Dec. 12, 2018, Jan. 21 and Feb. 19 in 2019. A full moon gives the peaks and boulders a new silvery dimension and while bathing in this light you may want to explore the trail at night. 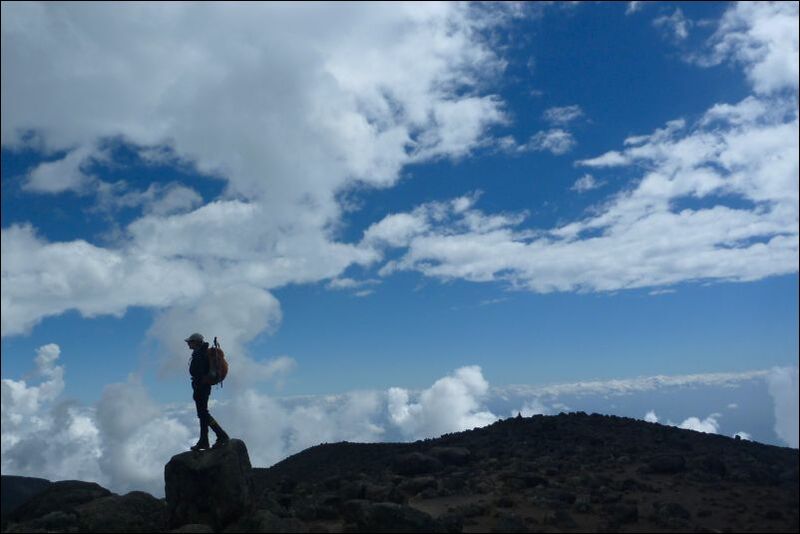 Kilimanjaro is a ruggedly magical place with or without a full moon, but when you combine it with the good weather, clear vistas, beautiful flora, a solid (less muddy) trail system you have the ingredients for a spectacular and successful summit climb.